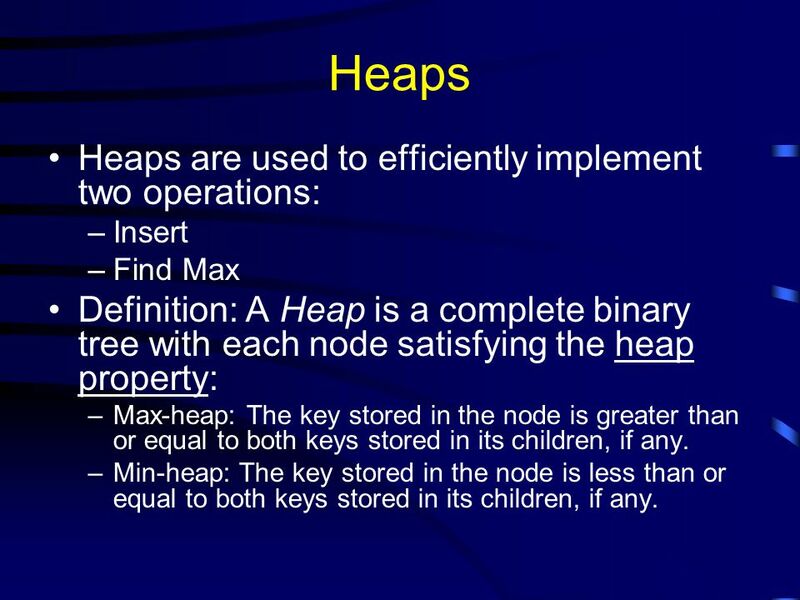 Insert Find Max Definition: A Heap is a complete binary tree with each node satisfying the heap property: Max-heap: The key stored in the node is greater than or equal to both keys stored in its children, if any. 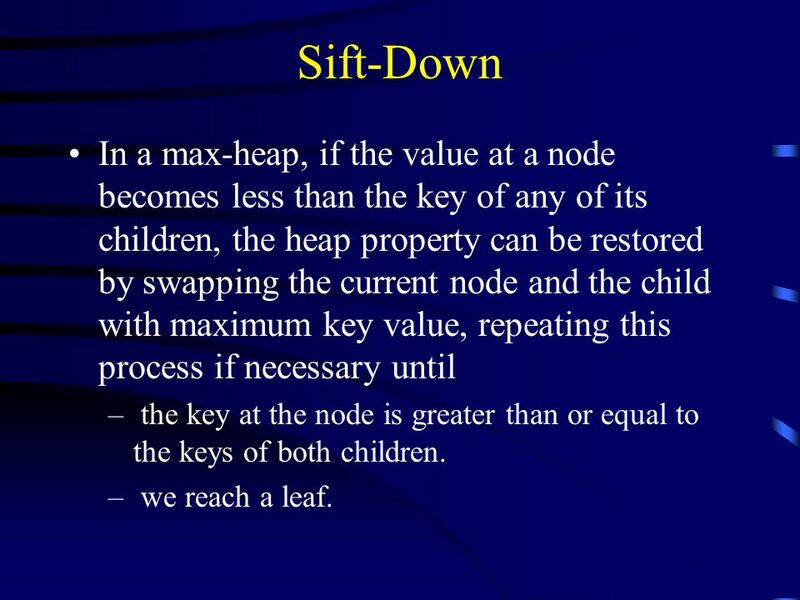 Min-heap: The key stored in the node is less than or equal to both keys stored in its children, if any. 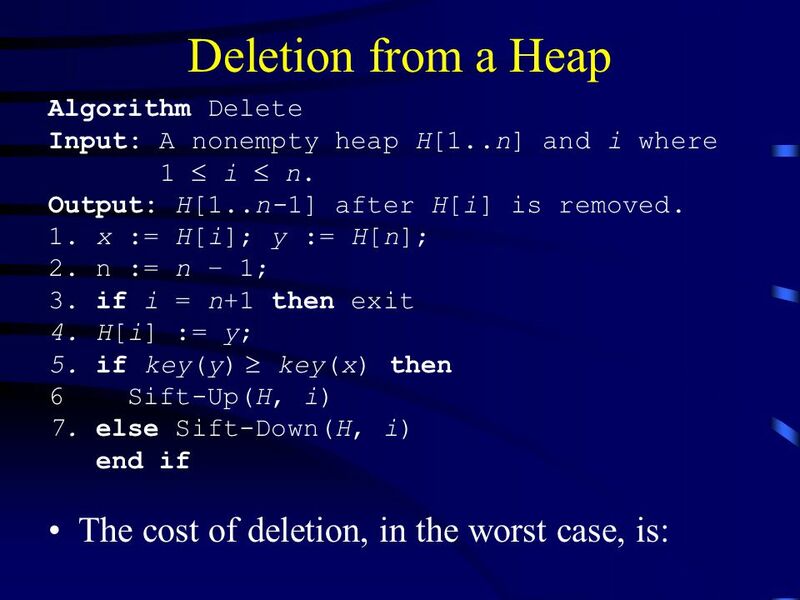 3 Heap Operations The heap data structure supports the following operations delete_max[H] (or delete_min[H]): insert[H,x]: delete[H,i]: makeheap[A]: Implementation of the above operations necessitates the introduction of two subprograms, viz. sift-up and sift-down. We restrict our discussion to max-heaps. 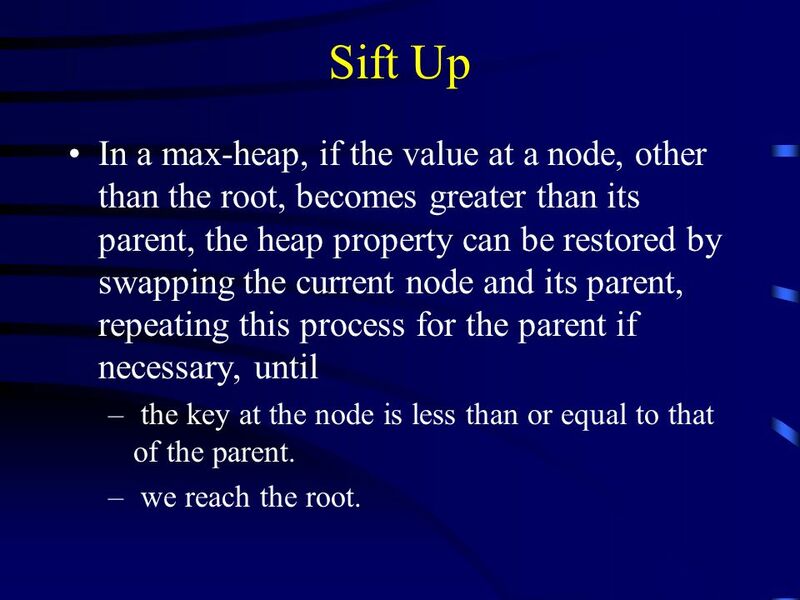 4 Sift Up In a max-heap, if the value at a node, other than the root, becomes greater than its parent, the heap property can be restored by swapping the current node and its parent, repeating this process for the parent if necessary, until the key at the node is less than or equal to that of the parent. we reach the root. 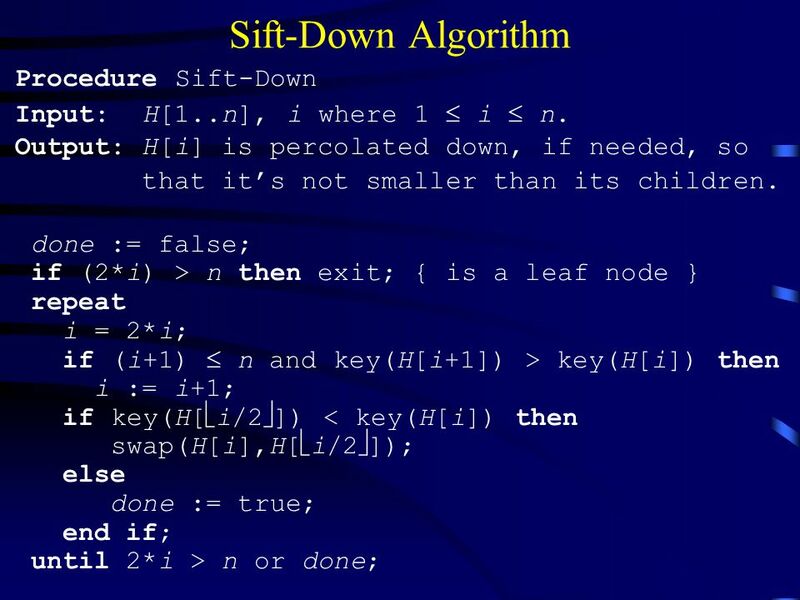 5 Sift Up Algorithm Procedure Sift-Up Input: H[1..n], i where 1  i  n.
7 Sift-Down In a max-heap, if the value at a node becomes less than the key of any of its children, the heap property can be restored by swapping the current node and the child with maximum key value, repeating this process if necessary until the key at the node is greater than or equal to the keys of both children. we reach a leaf. 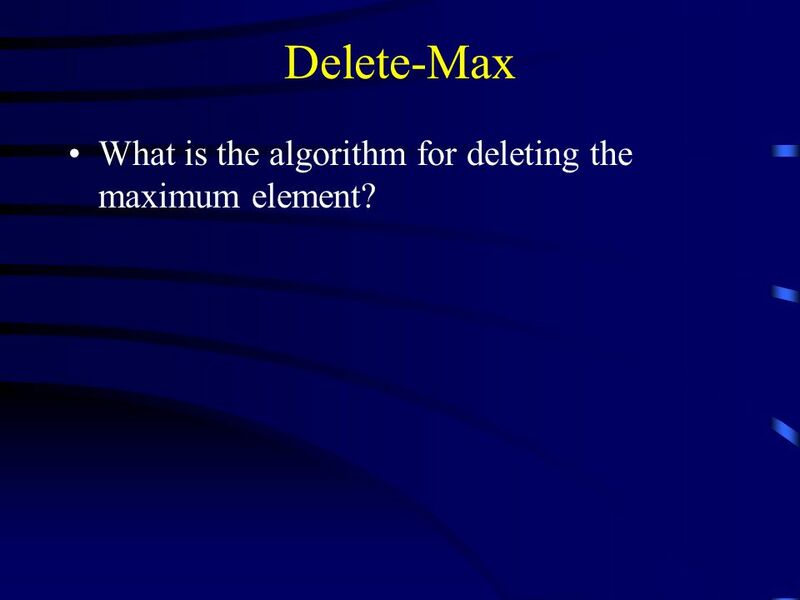 12 Delete-Max What is the algorithm for deleting the maximum element? 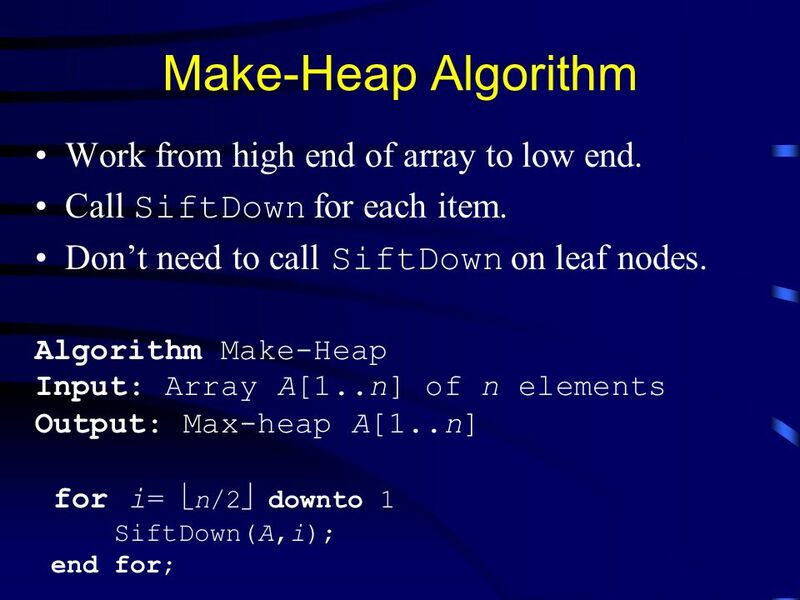 13 Make-Heap Algorithm Work from high end of array to low end. (i-1) is number of steps down, n/2i is number of nodes at that level. 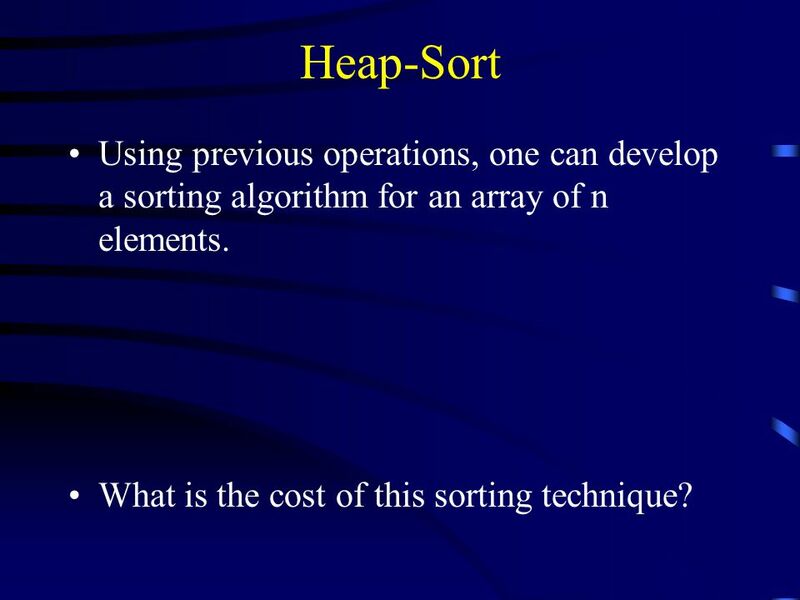 15 Heap-Sort Using previous operations, one can develop a sorting algorithm for an array of n elements. What is the cost of this sorting technique? 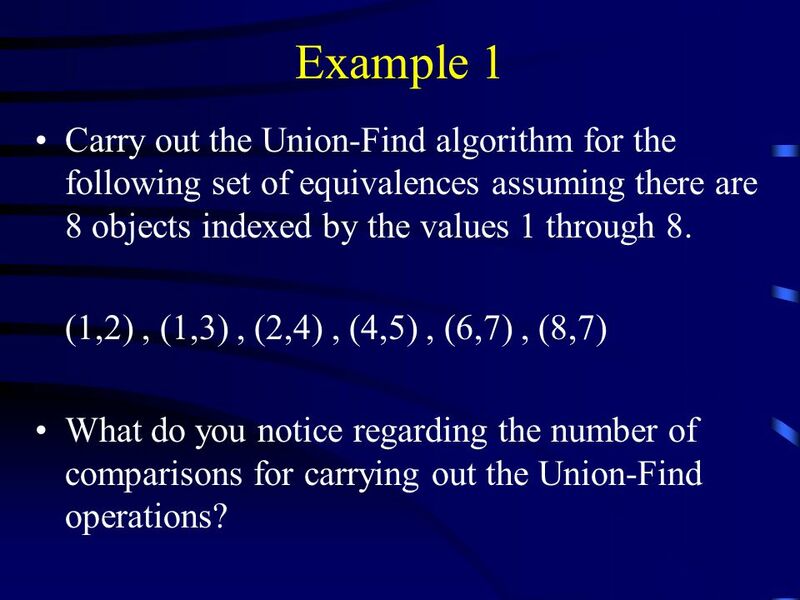 20 Example 1 Carry out the Union-Find algorithm for the following set of equivalences assuming there are 8 objects indexed by the values 1 through 8. 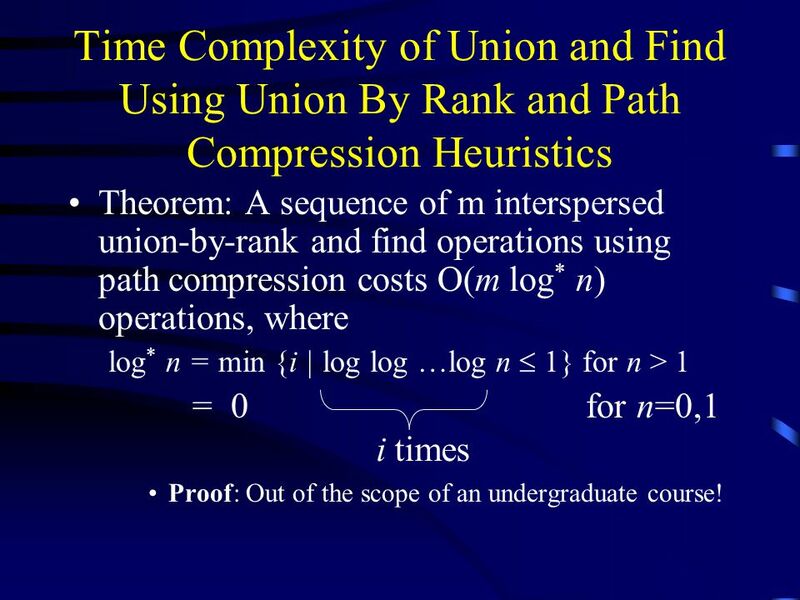 (1,2) , (1,3) , (2,4) , (4,5) , (6,7) , (8,7) What do you notice regarding the number of comparisons for carrying out the Union-Find operations? Objective: Want to keep the depth small. 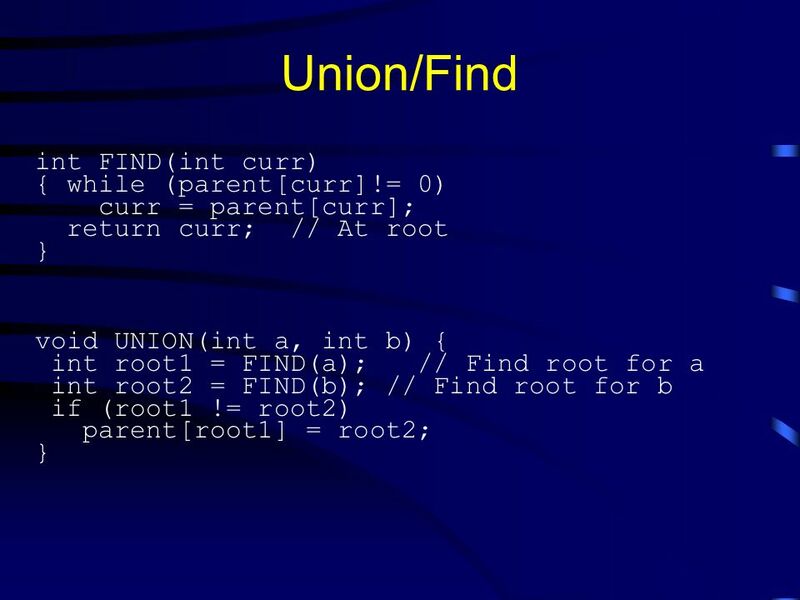 Procedure: To carry out the union of the two trees rooted at x and y, respectively, make the root node of the tree with higher rank the root of the Union tree with one of its children being the root node of the other tree. 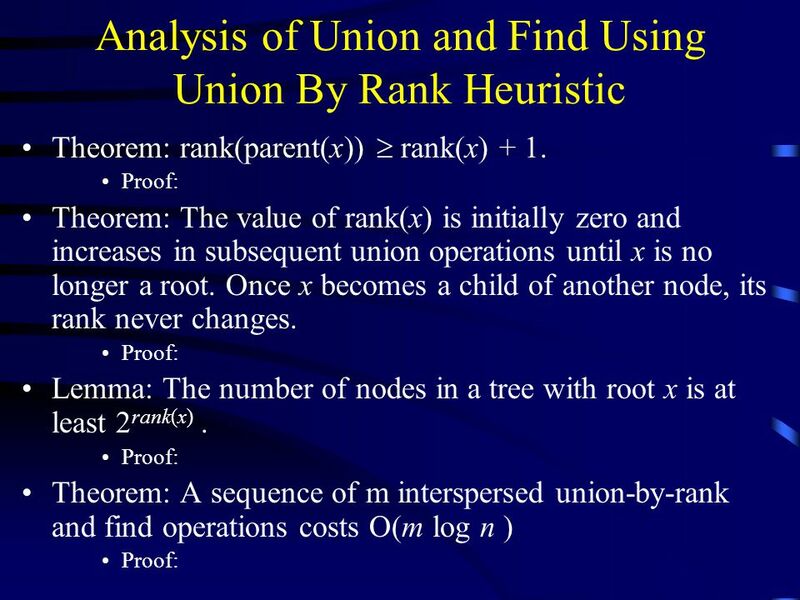 The rank is the height of each node in the tree When the ranks of the two root nodes are equal, make the root of the second tree the parent of the root of the first tree. 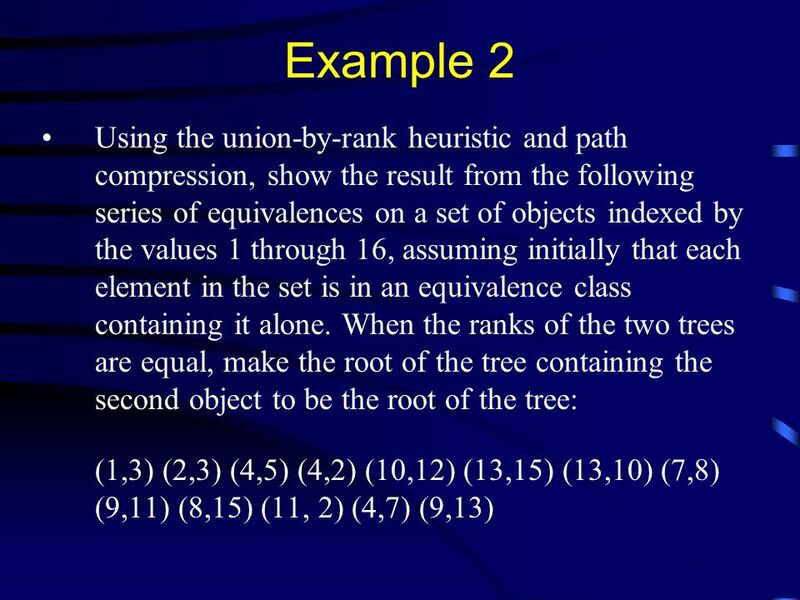 24 Example 2 Using the union-by-rank heuristic and path compression, show the result from the following series of equivalences on a set of objects indexed by the values 1 through 16, assuming initially that each element in the set is in an equivalence class containing it alone. When the ranks of the two trees are equal, make the root of the tree containing the second object to be the root of the tree: (1,3) (2,3) (4,5) (4,2) (10,12) (13,15) (13,10) (7,8) (9,11) (8,15) (11, 2) (4,7) (9,13) Initially, all objects are in separate sets (equivalence classes). (b) shows the result of processing equivalences (A, B), (C, H), (G, F), (D, E), and (I, F). (c) shows the result of processing equivalences (H, A) and (E, G). Note that weighted union is used. 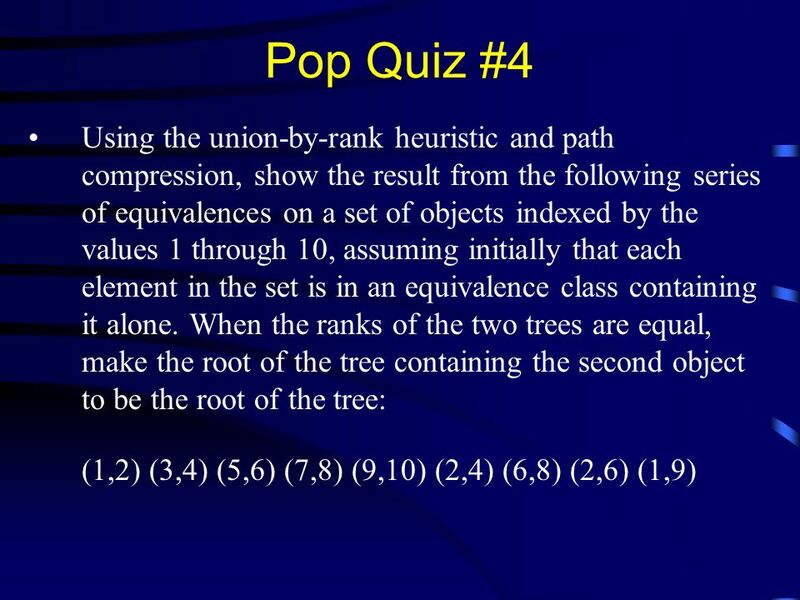 25 Pop Quiz #4 Using the union-by-rank heuristic and path compression, show the result from the following series of equivalences on a set of objects indexed by the values 1 through 10, assuming initially that each element in the set is in an equivalence class containing it alone. When the ranks of the two trees are equal, make the root of the tree containing the second object to be the root of the tree: (1,2) (3,4) (5,6) (7,8) (9,10) (2,4) (6,8) (2,6) (1,9) Initially, all objects are in separate sets (equivalence classes). (b) shows the result of processing equivalences (A, B), (C, H), (G, F), (D, E), and (I, F). (c) shows the result of processing equivalences (H, A) and (E, G). Note that weighted union is used. 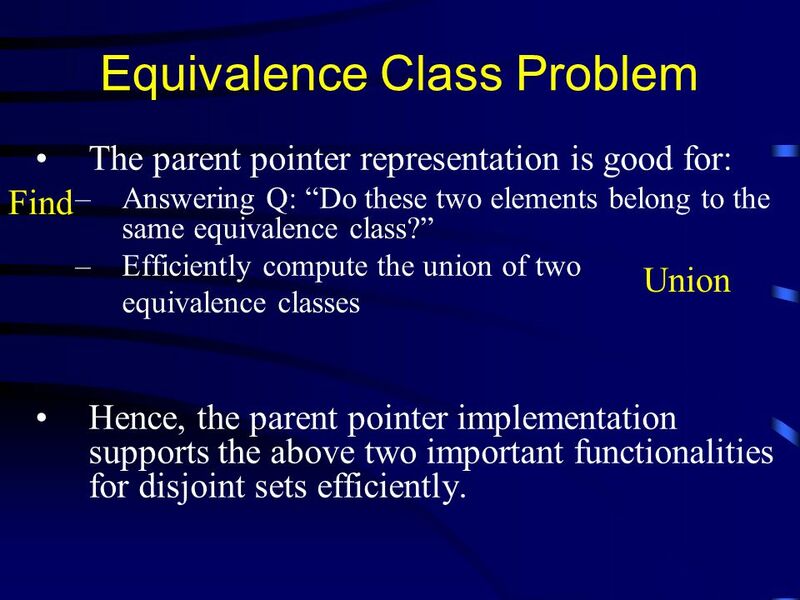 Download ppt "Heaps Heaps are used to efficiently implement two operations:"
1 Union-find. 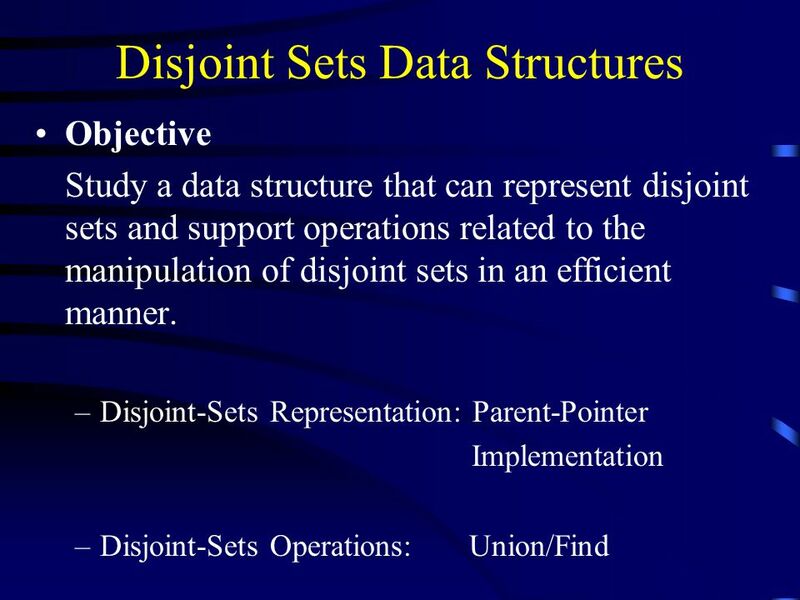 2 Maintain a collection of disjoint sets under the following two operations S 3 = Union(S 1,S 2 ) Find(x) : returns the set containing x.
CMSC 341 Binary Heaps Priority Queues. 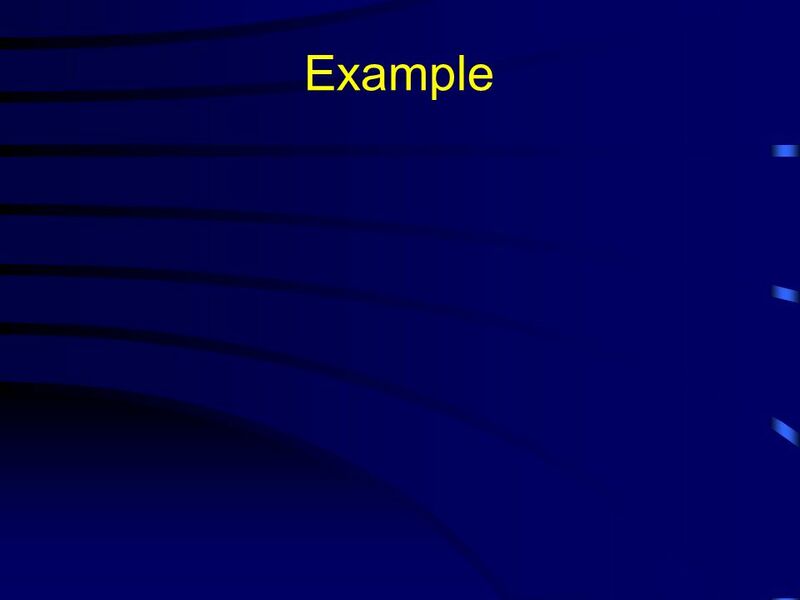 8/3/2007 UMBC CSMC 341 PQueue 2 Priority Queues Priority: some property of an object that allows it to be prioritized. BY Lecturer: Aisha Dawood. 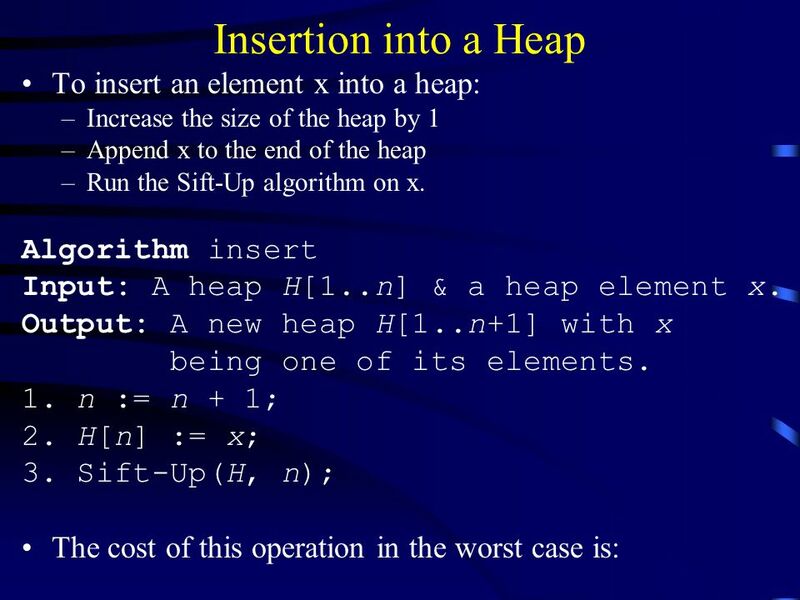 Heapsort  O(n log n) worst case like merge sort. 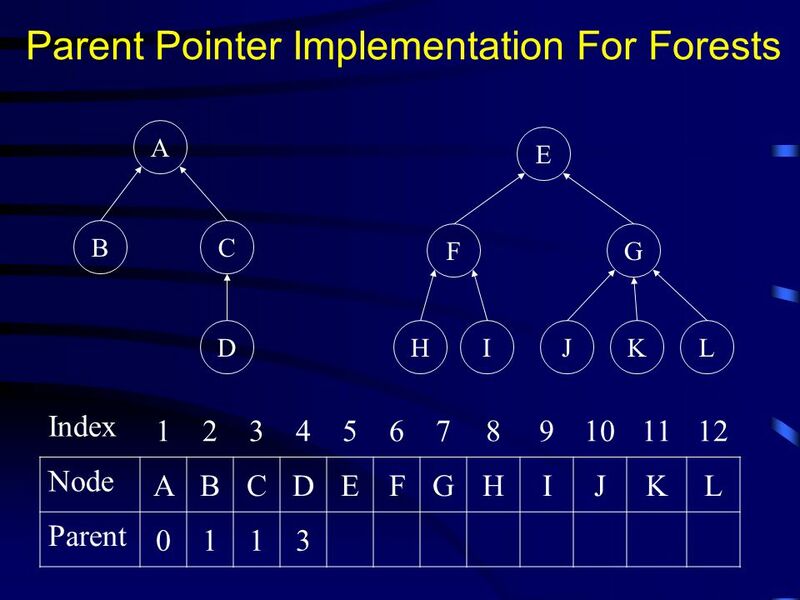  Sorts in place like insertion sort.  Combines the best of both algorithms. 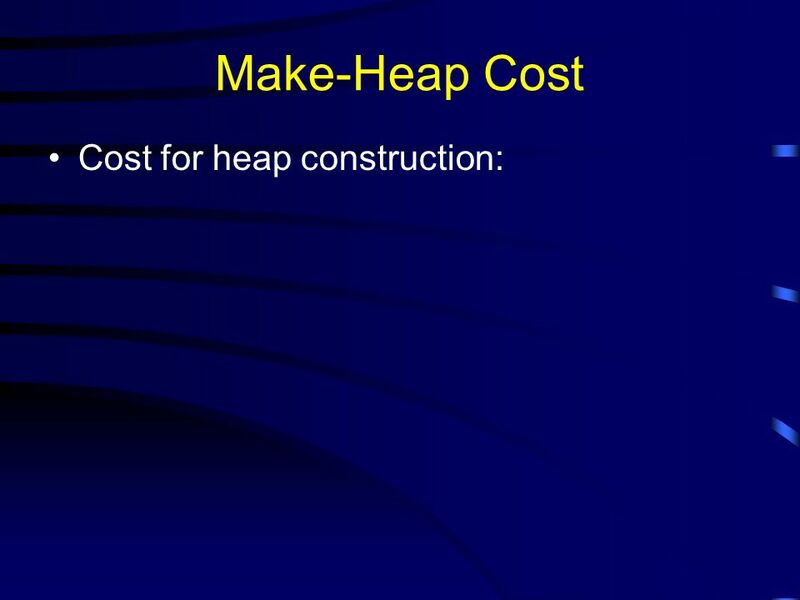 CS 315 March 24 Goals: Heap (Chapter 6) priority queue definition of a heap Algorithms for Insert DeleteMin percolate-down Build-heap. Heapsort. 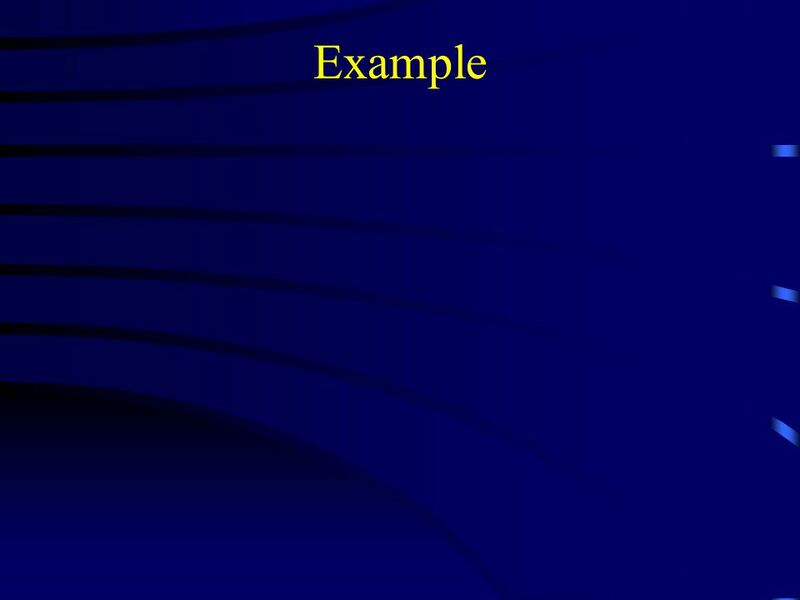 2 Why study Heapsort? It is a well-known, traditional sorting algorithm you will be expected to know Heapsort is always O(n log n) Quicksort. Binary Heaps What is a Binary Heap? 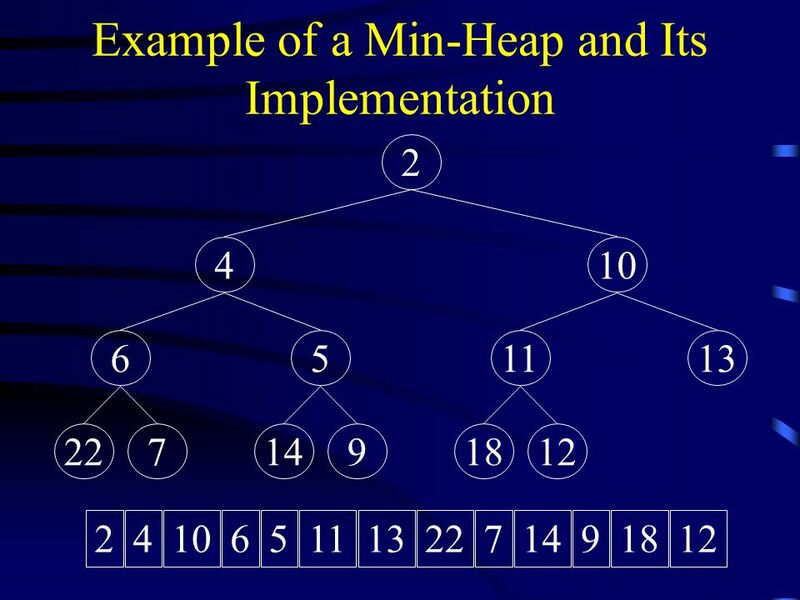 Array representation of a Binary Heap MinHeap implementation Operations on Binary Heaps: enqueue dequeue deleting an. Lec 6 Feb 17, 2011  Section 2.5 of text (review of heap)  Chapter 3. © 2004 Goodrich, Tamassia Heaps © 2004 Goodrich, Tamassia Heaps2 Priority Queue Sorting (§ 8.1.4) We can use a priority queue to sort a set. Priority Queues. Container of elements where each element has an associated key A key is an attribute that can identify rank or weight of an element Examples. Priority Queues1 Part-D1 Priority Queues. Priority Queues2 Priority Queue ADT (§ 7.1.3) A priority queue stores a collection of entries Each entry is. 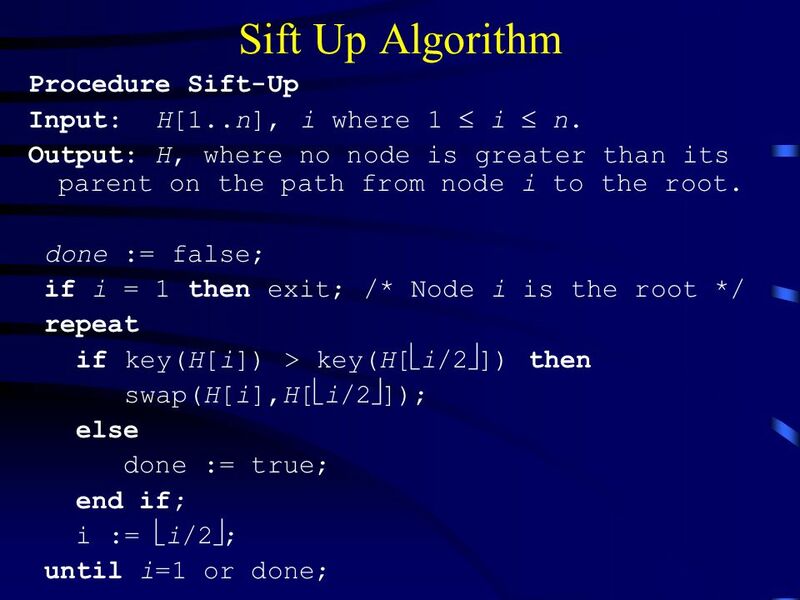 Lecture 11 Binary Heap King Fahd University of Petroleum & Minerals College of Computer Science & Engineering Information & Computer Science Department. Heapsort CIS 606 Spring Overview Heapsort – O(n lg n) worst case—like merge sort. – Sorts in place—like insertion sort. – Combines the best of both. 1 Binary Heaps What is a Binary Heap? Array representation of a Binary Heap MinHeap implementation Operations on Binary Heaps: enqueue dequeue deleting.